WASHINGTON — NASA used a briefing about the agency’s next Earth science mission to also emphasize the importance of that research in general, given concerns the next administration may seek to slash funding for it. A Nov. 10 briefing at NASA Headquarters about the upcoming launch of the Cyclone Global Navigation Satellite System (CYGNSS) mission featured an introduction by Thomas Zurbuchen, the new associate administrator for science, who talked not about the mission itself but about NASA’s Earth science work in general. While making no direct reference to politics, he made those comments less than 36 hours after Republican presidential candidate Donald Trump declared victory in the Nov. 8 presidential election. Trump’s space policy platform, which came into focus only in the final weeks of the campaign, called for reducing funding for Earth science in favor of exploration missions. That campaign position is shared by a number of Republican members of Congress, who in recent years have criticized what they believe is an overemphasis on Earth science work that could be done by other agencies. “Since the end of the last administration, we have seen a disproportionate increase in the amount of federal funds that have been allocated to the Earth science program, at the expense of, and in comparison to, exploration and space operations, planetary science, heliophysics, and astrophysics,” said Sen. Ted Cruz (R-Texas), chairman of the Senate space subcommittee and a former 2016 presidential candidate, in a March 2015 hearing about NASA’s budget. Appropriators in the House in particular have sought to cut spending on NASA’s Earth science programs. In its fiscal year 2017 budget request, NASA sought $2.03 billion for Earth sciences, an increase of more than $100 million from what it received in 2016. While a Senate bill would provide NASA with nearly all that amount, House appropriators cut Earth science funding by nearly 20 percent in their bill. A final 2017 appropriations bill has not been passed by Congress, but could be taken up during a lame duck session that begins Nov. 14. However, Congressional efforts to cut Earth science funding have been largely unsuccessful in recent years. Appropriations for Earth science have tracked closely to the agency’s request, even as those budgets grew from $1.66 billion in fiscal year 2013 to $1.92 billion in 2016. Those budgets have helped support the development of missions like CYGNSS, a constellation of eight small satellites scheduled for launch Dec. 12 on a Pegasus XL. 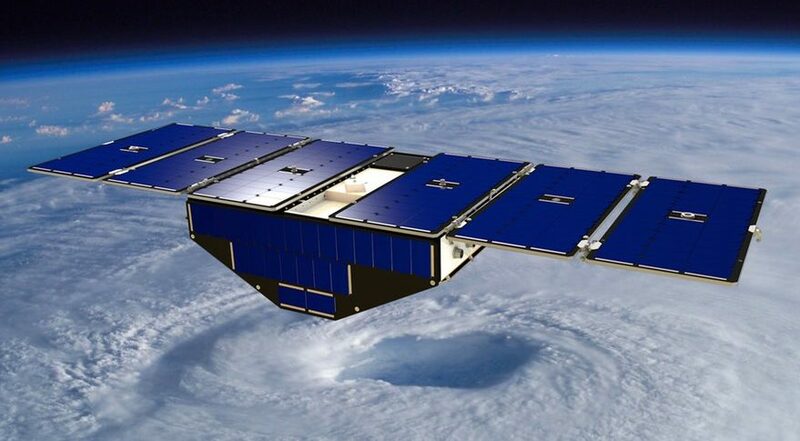 The satellites will detect GPS signals reflected off the oceans in tropical regions, using the amount of scattering of the signals to calculate the roughness of the oceans and thus the wind speeds at the surface. That data, scientists said at the Nov. 10 briefing, can be used to improve hurricane forecasting by providing more data and in a more timely manner than possible with other satellites or hurricane-tracking aircraft. “CYGNSS is a tool that will provide us 24/7 coverage of the tropical cyclone zone, and it will improve our knowledge of how hurricanes grow so that we can better prepare and protect the people in the path of each hurricane as it comes,” said Christine Bonniksen, program executive for the mission at NASA Headquarters. NASA also emphasized the low cost of this mission, which takes advantage of advances in smallsat technologies. Bonniksen estimated the total cost of the CYGNSS mission, including launch and operations, at $162 million. A mission that supports weather forecasting, though, could be the sort of mission that a new administration believes would be better performed by an agency like the National Oceanic and Atmospheric Administration. That could mean transferring money from NASA to NOAA or other agencies to take on those missions, rather than redirecting the money within NASA to other science or exploration efforts. NOAA, though, has usually relied on NASA for support developing and operating missions, including those funded by NOAA itself, such as traditional weather satellites. That would make any transfer of missions or other responsibilities more difficult than simply shifting funding.